A new film produced by Newsy and the Texas Tribune is taking a look at America’s oil industry. 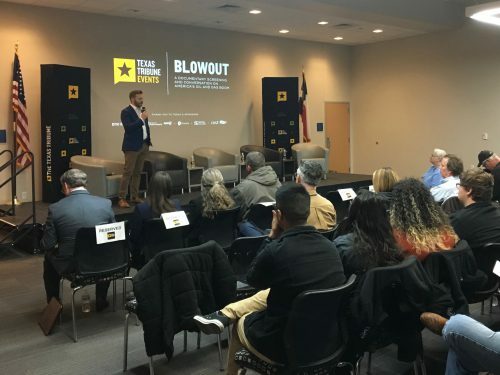 A large part of the movie focused on the Permian Basin, and last week, about 100 people turned out to see its public debut. “Blowout” is the title of the forthcoming documentary and it didn’t shy away from being critical of the industry. Odessa was the first city an excerpt of the film has been screened. The audience’s reaction was mixed. The 30 minutes shown focused on fracking and emissions from oil and gas sites, looking at potential health problems that can be caused by industry-related toxins. Some of the viewers felt the film was unfair and painted the oil industry in a bad light. Zach Toombs – the executive producer of documentaries at newsy – disagrees. Toombs said the documentary incorporates ideas about America’s oil industry people on both sides of the political spectrum may disagree with. The new film definitely accomplished one thing at its premiere — it got people talking, whether they liked the film or not. “Blowout” will be available to stream online later this year. The print series the Texas Tribune published alongside the documentary is available online now. This entry was posted in KRTS News and tagged Blowout, Documentary, Newsy, Odessa, oil, oil industry, Permian Basin, Texas Tribune. Bookmark the permalink.